The results of Bosnia’s presidential elections, specifically its Croat seat, have deepened diplomatic discord between Croatia and Bosnia. HDZ’s sister party in Croatia, led by Croatian Prime Minister Andrej Plenkovic, supported Covic financially and politically to secure his win, yet Komsic still won by more than 70,000 votes. 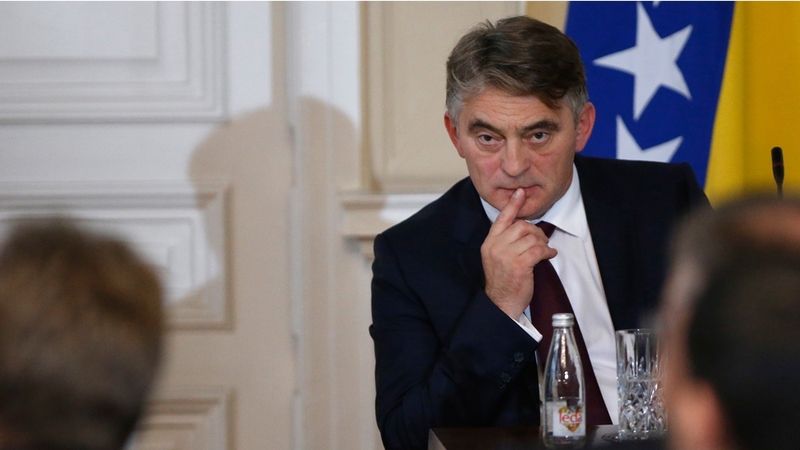 Since then, Croatia has denied the legitimacy of Komsic’s re-election – his third term since 2006 – arguing that he was heavily supported with votes by Bosniaks (Bosnian Muslims) who outnumber Croats living in the Federation entity. HDZ representatives claim that presidency members can only be legitimately elected by members of their “own people” and that votes should be counted from cantons with a clear Croat majority in order to outvote Bosniaks. According to Bosnia’s constitution formulated under the Dayton peace agreement in 1995, Bosnian citizens living in the Federation entity vote for the Croat and Bosniak member of presidency, while Bosnians living in the Serb-run entity of Republika Srpska vote for the Serb member of presidency. For months, Croatia has been lobbying the EU and NATO to force Bosnia to reform its electoral law and constitution, to ensure “equality among the three constituent people”. Last week, the Croatian parliament adopted a declaration (81 voted for, four abstained and 11 against) calling for Bosnia and Herzegovina (BIH) to enact these changes after a three-day deliberation. The resolution is not binding, but Bosnia views it as yet another attack on its sovereignty. The Zagreb government is working directly against the professed interests of the EU in its present approach to Bosnia. Jasmin Mujanovic, a political scientist who focuses on southeastern Europe, told Al Jazeera that the push represents the most serious effort by HDZ in Croatia to undermine Bosnia in decades. “The combination of threats, disinformation, and brinkmanship has created the impression of virtual irredentism as far as their relationship with Bosnia and Herzegovina is concerned,” Mujanovic said. “It’s also alarming because it represents a sharp departure from the established EU approach to [Bosnia and Herzegovina]. So while officials in Brussels are calling for dialogue and, in the long term, constitutional reform to address the structural flaws with the Dayton constitution, the HDZ is insisting upon a reactionary, zero-sum programme that actually strengthens the most problematic, segregationist aspects of Bosnia’s legal order. Earlier in December, Carl Bildt, Christian Schwarz-Schilling and Paddy Ashdown, three former governors of Bosnia and Herzegovina, urged the EU to stop Croatia from interfering in Bosnia’s political affairs. In a joint letter submitted to Federica Mogherini, the former high representatives wrote that they were “deeply concerned by Croatia’s continued meddling”, advising that any electoral reform should aim to make Bosnia more cohesive rather than divide it further along ethnic lines. “Neither [Bosnia and Herzegovina’s constitution nor election law] state that presidency members must be elected by members of their ‘own group’. The priority is for the government to be formed, they advised. Croatia rejected the letter, with Plenkovic responding that no one knows Bosnia better than Croatia and that as a signatory of the Dayton peace accords in 1995 which ended the war, Croatia has an obligation to look after all Croats in the diaspora, according to Croatia’s constitution. This, however, is not stipulated in the peace accords. “No one in Dayton ever thought that such provisions would occur on the ground, that Bosniaks who number three times more than Croats could pick both members of the presidency. That makes no sense,” Plenkovic told media, adding that as long as he is president, he won’t give up on the issue. According to Bosnia’s 2013 census, Croats account for 15.43 perent of the population, the vast majority of whom live in the Federation. Some Croats are now unhappy because their preferred nationalist candidates don’t always win Croat-designated seats in Bosnia’s elaborate power-sharing arrangements. That does not prove inequality of Croats as a constituent people. Daniel Serwer, who served as the US special envoy for the Federation entity and helped to negotiate the Dayton peace accords, explained that the Croat question is a political – not legal – issue. “The Bosnian Croats got a good deal at Dayton in 1995, when Croatia was vital to routing Serb forces,” Serwer told Al Jazeera. Critics of the HDZ have pointed out that in any case, two-thirds of Croats didn’t vote for Covic according to Bosnia’s Central Election Commission. Furthermore, HDZ’s proposal would isolate Croats living in Bosniak-majority cantons as they would not be able to vote. Croatia has raised the issue at EU meetings several times. In October, Croatian MEPs warned in a joint letter to the European Parliament that “developments” following the election results “might affect the stability of Bosnia and the wider region”. During a meeting in November with Jens Stoltenberg, secretary general of NATO, Croatian HDZ MP Miroslav Tudjman said they had made electoral and constitutional reform a condition for Bosnia in order to continue its Euro-Atlantic integration and eventually join NATO. However, Croatian political analyst Zarko Puhovski told Al Jazeera that the lobbying and the recently adopted declaration don’t amount to violating Bosnia’s sovereignty as it doesn’t exist. “Bosnia is half a state, half a protectorate … it’s not a state in the full sense,” Puhovski said, referring to the international Office of the High Representative which holds ultimate authority over Bosnian officials. Puhovski explained that a civic society with a one-person one-vote system, that would abolish problematic ethnic lines, would require a complete reconstruction of the Dayton accords, which has no chance of happening. The demand for a third electoral unit would be a step towards creating a third, Croat entity, said analysts. Serwer explained in his blog that HDZ’s argument is not legal, but political. “The ruse of electoral illegitimacy and the resulting crisis is simply another effort toward the HDZ’s territorial ambitions of creating a so-called ‘third entity’. In this, the HDZ leaders are publicly backed by the Government of Croatia and the Russian Federation,” Serwer wrote. Mujanovic told Al Jazeera that the issue centres on the HDZ’s pursuit of permanent power by maintaining and further deepening the country’s “segregationist regime”. “The creation of a so-called third entity is the most obvious way to do this; the HDZ is deeply envious of the one-party regime Dodik has built in the Republika Srpska; they want the same in Western Herzegovina,” Mujanovic said. “But if they can’t have a third entity, they are prepared to settle for certain, ‘virtual’ versions thereof, which is what most of their machinations regarding the elections law are about. “In fact, in the past Dragan Covic has explicitly referred to his preferred solutions to this issue as the creation of ‘virtual election units’, in other words, a third entity at the level of the electoral law,” Mujanovic said. Mario Karamatic, head of the Bosnian Croat caucus in the House of Peoples, told local media this week that Bosnian Croat political parties are indeed discussing the recreation of the separate Croat republic, “Herceg-Bosna”, which was dismantled following the peace accords. The International Criminal Tribunal for former Yugoslavia had ruled that it was a project of a “joint criminal enterprise” in which Croatia held parts of Bosnia and Herzegovina under a state of occupation, with the goal of annexing the territory.